Iâ€™m proud of our partnership and your unalloyed loyalty and your commitment to the service of Nigeria.â€ These were the words of President Muhammadu Buhari to his deputy Prof Yemi Osinbajo, whose aircraft crash landed in Kabba, Kogi State, at the weekend. The statement reported the President as praising Osinbajo for his â€œresilienceâ€. â€œIt is tenacious spirit and amazing spiritual strength to survive a helicopter crash without being paralysed by its impact,â€ the President was quoted as saying. According to Shehu, the President told Osinbajo during the phone call: â€œWe give glory to Almighty God for sparing your life. Iâ€™m impressed by your tenacious spirit which enabled you to continue on your campaign engagement, despite the shock of the crash. â€œIâ€™m proud of our partnership and your unalloyed loyalty and your commitment to the service of Nigeria. â€œThat you proceeded with your engagements, despite the accident, is a testimony of your passion for service to country and a reflection of your admirable spiritual fervour. Speaking at a thanksgiving service yesterday, Prof Osinbajo said that no amount of thanksgiving and praises to God would be enough for saving his life and nine others in Saturdayâ€™s helicopter crash. He went on: â€œIt would have been breaking news on local and international media that Vice President Osinbajo and nine crew members died in a helicopter crash, but God did not allow such to happen. â€œNo amount of thanksgiving and praises to God would be enough for saving my life and nine crew on board. God is the one, who can do all things, and only Him can take the glory; we return the glory to Him. 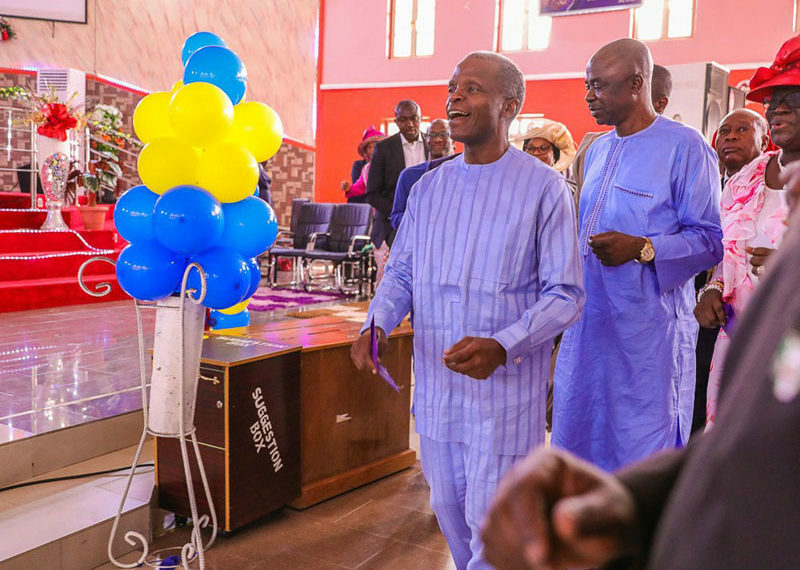 In a live telecast from the RCCG headquarters, Lagos, the General Overseer of the church, Pastor Enoch Adeboye, asked the congregation to rise and give glory to God for saving Osinbajoâ€™s life. According to Adeboye, the devil wanted to take Osinabjoâ€™s life, but God put the devil to shame. In his sermon, titled: â€œCarriers of Godâ€™s gloryâ€, Pastor Adeboye said for anybody to carry the glory of God, such a person must be a true child of God and live a life of holiness. Taking his lesson from the Bible in the book of Matthew 5: 14- 15, he said: â€œYe are the light of the world. A city that is set on a hill cannot be hid. â€œAs a carrier of His glory, anywhere you arrive, darkness will automatically disappear. â€œWhen God begins to use you, the glory belongs to God and you must learn to always give glory to God. â€œDo not ascribe the glory to yourself because it is not yours; it belongs to God,â€ Pastor Adeboye counseled. CAN President Rev. Samson Ayokunle also appreciated God for the vice presidentâ€™s safety. A statement in Abuja by his Special Assistant, Media and Communications, Pastor Adebayo Oladeji quoted him as saying: â€œThe leadership of CAN is grateful to God and rejoice with the Federal Government and Osinbajo. â€œIt is our prayers that God will continue to watch over him and other top government functionaries in Jesusâ€™ Name,â€ he was quoted as saying. The message reads: â€œTo family, friends and associates thank you all for your concern and show of love and affection. I canâ€™t thank you enough. It was a miracle we survived. The belts did a marvelous job and so were the security men on ground, who quickly pulled us out of the wreckage not minding their own safety. â€œWe were also calm all through the ordeal. There was no panic of any kind. The immediate concern of all of us was the safety of our principal. We ensured he got out first. He too ensured we were all out before going into a vehicle. â€œWhen we were all safely in the bus, he insisted the assignment must go on and we drove to the palace of Obaro of Kabba. The Kabba people gave us a warm welcome and showered us with prayers. We thank them all.